January 23, 2017 – Holy Families! How many of the adults in your congregation know the names of all or most of the children who are a part of the parish? All too often there is a disconnect between adults and children in churches, unless the adult is actively involved in some aspect of youth ministry. 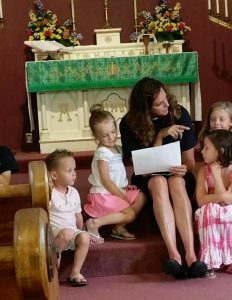 It is vital for children's faith formation that adults besides their parents and grandparents get involved in their faith lives. Statistics show that of the youth who are actively involved in church in Middle and High School, 50% will walk away from the faith while in college. How can the Body of Christ nurture young people in the faith AND maintain an active relationship with youth when they go off to college, the military or even begin working in the community? Connect an adult with a child and ask them to be "prayer partners" for a year. Make sure to create opportunities within the community for prayer partners to sit and talk together so they can foster a lasting relationship. Have Sunday School kids gather together and go visit people from the congregation who are shut-ins or who are living in a nursing home. They can make cards and drawings to take along. While you're there, take a photo of the kids with the person they are visiting. Be sure to send a copy to that person - they will love it! Start a "Secret Friend" exchange by putting names of adults and kids who want to participate in separate boxes. Make sure to ask a few questions on the sign up sheet so the secret friend knows what the other person likes. (Parents of children will have to get involved so the kids remember to keep the friendship going.) Ask questions on the sign up sheet such as: What's your favorite candy? What is your favorite food? When is your birthday? Create a space in the church where secret friends can drop off cards and gifts for each other during the year. At the end of the year, have a get together to reveal to one another who's secret friend each person is. Invite older members of the congregation to visit catechism classes and to be mentors to confirmands.